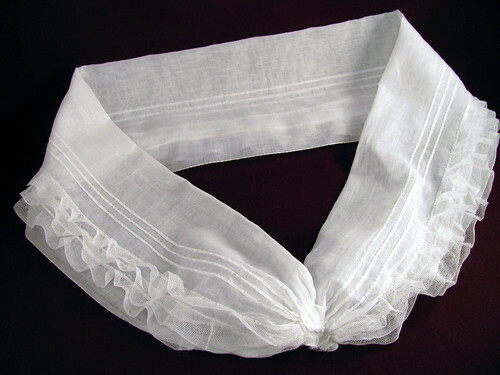 I found a real life fichu among the the sundries in the cedar chest. It was discolored and full of starch. So I soaked it for a day and it is like new. Now I just need to find a Jane Austin Tea party to attend. Just kidding, but my upstairs balcony does look like like the Bennett girls have been busy. I have been using the railing that looks over the living room to dry the little lace pieces. It is right outside my sewing room, a very convenient location. 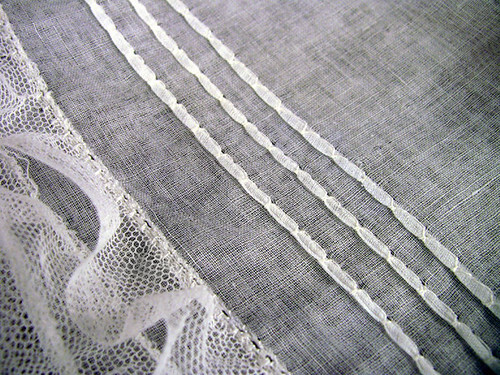 The fabric on the fichu is so thin, but cottony. I haven’t seen anything like it in the fabric stores. The most interesting detail is the way the inside hem is rolled. It is stitched by hand pulling only a few threads together with each stitch. It is such a fine finish. Much better than my current way of hemming fine fabrics. 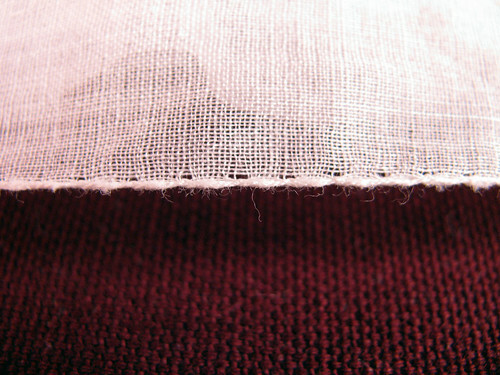 The tucks are made by machine and similar ones that can be done with the blind hem feature most machines have now. I date it from the early 1900’s, about the time they were going out of style. Fichus started out being triangular but changed over the 80 odd years they were popular. I think a cameo brooch pinned in the middle covering the raw edges would have been all that was needed for it to adorn the neckline of a party dress. The color of this photo is off, maybe because it is focused so close. This entry was posted on Saturday, March 28th, 2009 at 3:00 am and is filed under Sewing and Vintage. Tagged: Clothing, Sewing, Vintage. You can feed this entry. You can leave a response, or trackback from your own site.